The church was the driving force behind the development of early classical music; nowadays, it’s the film industry and (unfortunately) advertising which pay the classical composer’s way. Modern ‘popular classical’ music has taken on a dance-music character, with shorter chord progressions, less of a tendency towards quirky melody lines, and an avoidance of the highly-emphasised, overblown cadence popular in Beethoven’s time. 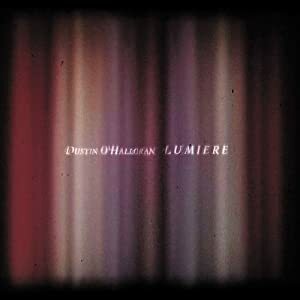 Composer Dustin O’Halloran’s album ‘Lumiere’ follows this trend, proceeding quite uniformly and softly through its 45 minute running time, and probably having more in common with Einaudi (and even muzak) than with the likes of Penguin Café Orchestra and Kronos Quartet – but it reminds me most of the music for certain flash games, these two excellent examples in particular: ‘The Company Of Myself’, and ‘Continuity‘. There is some solo piano, but the majority of the songs are piano with strings, giving Lumiere a fairly uniform feel. The main failing of this album is its lack of emotional variety. It’s very much background – and not just because of the arrangements – the music simply doesn’t give you anything other than an invitation to relax. It fails to fill me with hope, joy, sadness – or indeed anything other than chilledness. It’s so non-intrusive that I have got away with listening to it at work, (where it quite nicely keeps me from exploding). It’s easy to imagine these songs providing musical accompaniment to various on-screen events and adverts – so (without in any way seeking to belittle what is a nice collection of songs) I have done exactly that, based on the first 30 seconds of each tune. A Great Divide: The next 02 advert. Voice over by Sean Bean, introducing a new contract with free minutes to bankers, so you can harangue them about their bonuses. Opus 44: A household scene, happy family, smiling baby. Probably advertising life insurance, maybe bleach. We Move Lightly: Late night drives past unfamiliar cities. Evokes the distance and separation brought about by countless panes of glass that we can see through, but never pass. Either that or moisturiser. A definite highlight. Opus 43: Another highlight, this track conjures images of the morning sunlight, and the second section uses a very simple solo piano with interesting harmonies to great effect. Basically it’s an alternative soundtrack for the bit in ‘The Snowman’ where he comes out in the morning and finds it’s melted. Quintet No.1: Inspector Morse sighs as he slumps down on his couch. The case is solved, but he just can’t quite come to grips with the pointlessness of it all. Fragile No.4: Picture a the majesty of sweeping cliff faces towering above the North Sea. Two artcic terns have built a nest, and are struggling to bring up their young in this most testing of places. It turns out it’s all a metaphor to sell you a bank-loan. Opus 55: Sean’s back, telling you that you can now send cheeseburgers via text message. Snow And Light: One of those train commercials that shows a man riding past a queue of motorway traffic in pure tranquility (glossing over the fact that he got soaked on the platform waiting for a train that was delayed by an hour, and there are now a dozen rowdy Stoke City fans three seats behind, moving on to their second crate of beer and singing football songs). I have a lot of classical music, and this doesn’t match up to the best – but it fits a particular niche, and it’s perfect for that. I won’t listen to it often, but if you want some easily accessible music that sounds like classical without being at all challenging, then this is it.